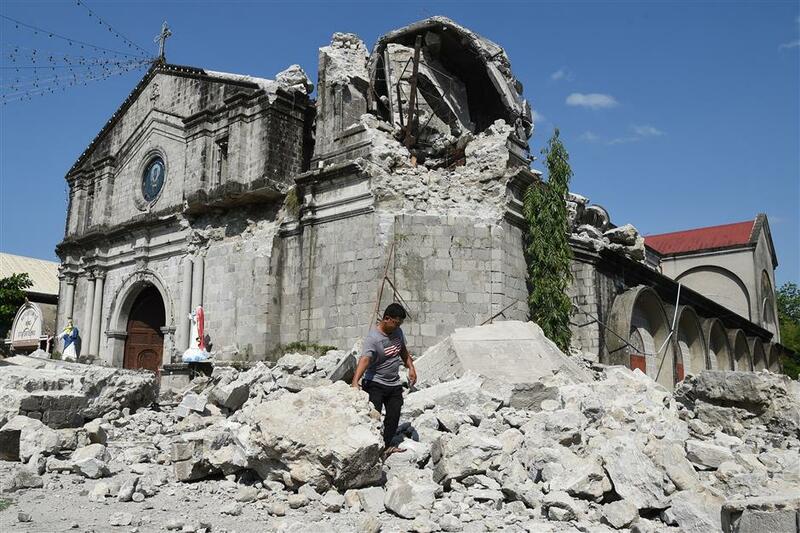 A church worker walks past rubble of the 18th century St. Catherine of Alexandria after its bell tower was destroyed following an earthquake that struck the town of Porac, pampanga province on April 23, 2019. The death toll from Monday’s 6.1-magnitude earthquake that struck the Zambales province in the Philippine main Luzon Island has risen to 16, the government said on Tuesday. Ricardo Jalad, the executive director of the National Disaster Risk Reduction and Management Council (NDRRMC), said 81 people were also injured and 14 others remain missing in central Luzon provinces of Pampanga and Zambales. Of the 16, the national disaster agency said five were pulled from the collapsed four-storey supermarket building in Porac town, seven from different villages also in Porac town, two in Lubao town, one in Angeles City, in Pampanga province and one in San Marcelino town in Zambales province. A total of 29 structures and buildings were damaged, the NDRRMC said. 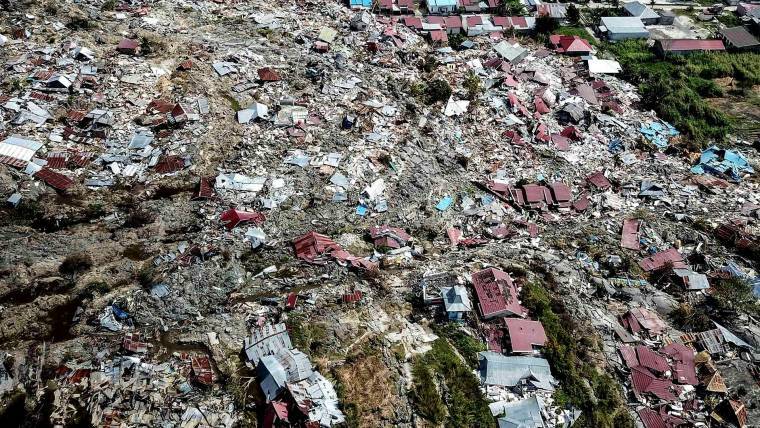 Monday’s earthquake also caused landslide in San Marcelino town, prompting the government to evacuate about 120 families living around the mountain. The Philippine Institute of Volcanology and Seismology (Phivolcs) said Monday’s quake was detected at a depth of 12 km, about 18 km northeast of Castillejos, a town in Zambales province in the western part of Luzon. The quake knocked down buildings and walls, and cracked road surfaces in Pampanga province and other parts of central Luzon. A number of churches, including a century-old Roman Catholic church, were also damaged. It also shook high-rise buildings in Metro Manila, the Philippine capital, prompting office workers to dash out of the building offices. Schools and offices in Metro Manila and outlying provinces were closed on Tuesday to make way for inspection of the buildings. Less than 24 hours after the 6.1-magnitude rocked the Philippines on Monday, another 6.5-magnitude earthquake struck the San Julian town in Eastern Samar province in the central Philippines at 1:37pm local time on Tuesday. No casualty has been reported except one minor injury in Tuesday’s earthquake so far. The Philippines, which lies along the Pacific Ring of Fire, have numerous active faults and trenches on both sides of the archipelago. Phivolcs said several quakes rattle this archipelagic country every day, though most are not felt. The geographic and geologic settings of the Philippines make this archipelagic country prone to earthquakes. Phivolcs records an average of 20 earthquakes a day and 100 to 150 earthquakes are felt per year. 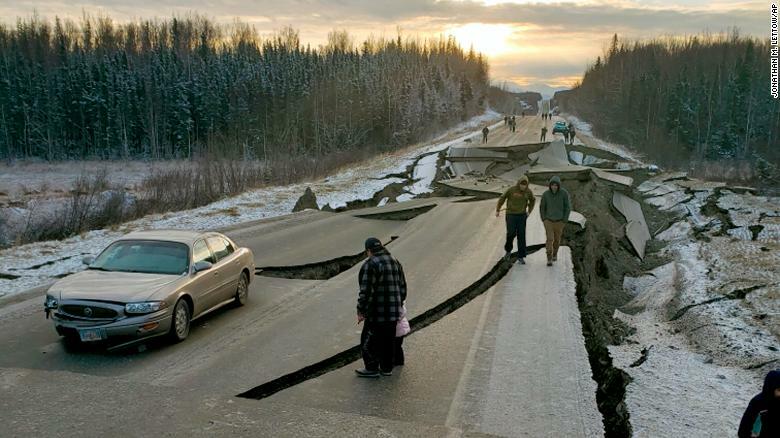 People walk along a road in Wasilla after Friday’s earthquake. CNN’s Sheena Jones, Amanda Watts, Dakin Andone, Shawn Nottingham, Chuck Johnston, Keith Allen and Matthew Hilk contributed to this report. 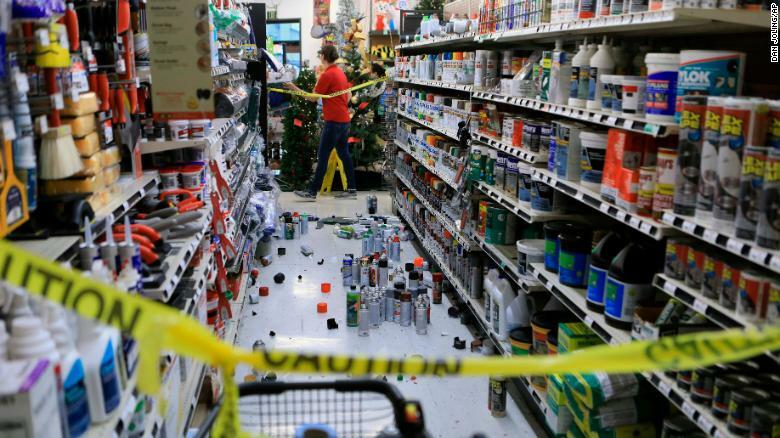 The 7.0 magnitude quake struck just 10 miles from Anchorage, a city of 300,000 people. 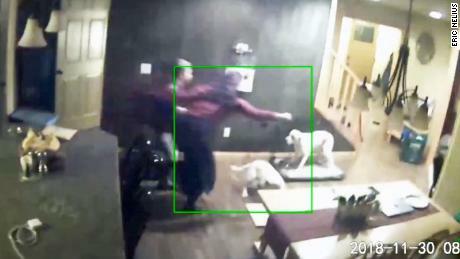 Residents of Anchorage, Alaska, are assessing the damage from a massive earthquake that struck Friday morning and are breathing a sigh of relief after officials canceled tsunami warnings. Measured as a magnitude 7.0 quake by the U.S. Geological Survey, the quake hit at 8:29 a.m. local time, with the epicenter just 10 miles from the city of nearly 300,000 residents. Residents of Fairbanks, a city of about 30,000 more than 350 miles away, reported feeling shaking there too. Though officials have yet to release any estimates of damage, injuries or fatalities, people have begun to share photos and videos of destruction on social media. 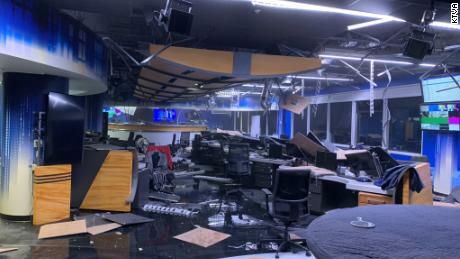 An image from the KTVA newsroom, the CBS affiliate station in Anchorage, shows collapsed tables and computers and TVs dangling from their mounts. All local TV stations were reportedly knocked off the air. 7.2 earthquake here in Anchorage, Alaska. This is a video my dad took from the Minnesota exit ramp from international. Officials canceled a tsunami warning posted for the Cook Inlet and southern Kenai Peninsula near Anchorage. The National Weather Service had warned residents in Kodiak and Seward that tsunami activity could start just an hour after the earthquake struck. A 7.0 quake can be highly dangerous. The 1989 Loma Prieta earthquake in San Francisco was measured at magnitude 6.9 and killed 63 people, and the 1994 magnitude 6.7 Northridge earthquake in Southern California killed 57 ― though both quakes struck areas more populous than Anchorage. That was the scariest earthquake I have ever been in. Lead on shift…we evacuated the NWS Anchorage building. AT LEAST 11 people are dead after a devastating 5.9 magnitude earthquake rocked Haiti, shaking the capital city of Port-au-Prince. The quake struck the nation, located just outside the Pacific’s deadly Ring of Fire, at 12.11 am BST on Sunday with a depth of 10 km. Pictures from the scene show crumbling building and damage to vehicles and walls after the devastating quake struck the Caribbean nation injuring up to 135 people. The quake was centered around 12 miles (20 km) west-northwest of Ti Port-de-Paix off Haiti’s north coast. The police chief for the north-west region, Jackson Hilaire, initially confirmed seven people died in Port-de-Paix, while the interior minister, Reynaldo Brunet, said three people had died further south in the town of Gros Morne. Le Nouvelliste newspaper said one person had died when an auditorium collapsed in Gros Morne. Detainees were also released from a police holding cell that was damaged. People flocked to social media to say the quake had been felt in Port-au-Prince, Haiti’s capital, but there had not been any major damage. Haiti is prone to earthquakes as the island sits adjacent to major fault lines along the so-called “Ring of Fire”. This is a horseshoe-shaped belt running around the Pacific Ocean where a large number of earthquakes and volcanic eruptions occur. Haiti’s Civil Protection agency says 135 injuries have been reported. But the full extent of the damage and number of casualties is still emerging as authorities assess the areas affected. Haiti’s president Jovenel Moïse said: “An earthquake with a magnitude of 5.8 has hit Haiti. “According to the first reports by the Civil Protection, there is damage in the Far North of the Island. “I am working closely with authorities for an appropriate response. This is the strongest earthquake to hit Haiti since 2010. In 2010, Haiti was devastated by a quake measuring 7.3 on the richter scale. The earthquake happened at 16:53 local time on Tuesday, 12 January 2010. By January 24, at least 52 aftershocks measuring 4.5 or greater were recorded. An estimated three million people were affected by the quake. More than 220,000 people were killed and over 300,000 were injured. The horrific earthquake, which was the biggest the region had seen in 200 years, left more than 1.5 million people homeless and resulted in an immense humanitarian crisis. (CNN) Authorities in Papua New Guinea are assessing the damage after a magnitude-7.5 earthquake struck the Pacific country early Monday. The US Geological Survey said the quake hit at 3:45 a.m. local time (12:45 p.m. ET Sunday) near Porgera, northwest of the capital Port Moresby. It was 35 kilometers deep. “The National Government has dispatched disaster assessment teams to parts of Southern Highlands Province and Hela Province following an earthquake in the early hours of this morning,” Chief Secretary to Government Isaac Lupari said in a statement. “The National Disaster Centre is working with provincial authorities to assess any damage and impacts on service delivery in the area. The Papua New Guinea Defence Force has also been mobilized to assist with the assessment and the delivery of assistance to affected people as well as the restoration of services and infrastructure,” the statement said. It estimated that the quake could have been felt by more than a million residents, with approximately 40,000 exposed to “violent” shaking. “Our thoughts are with the people of Papua New Guinea, especially in Southern Highlands and Hela Provinces, affected by this morning’s earthquake and aftershocks. 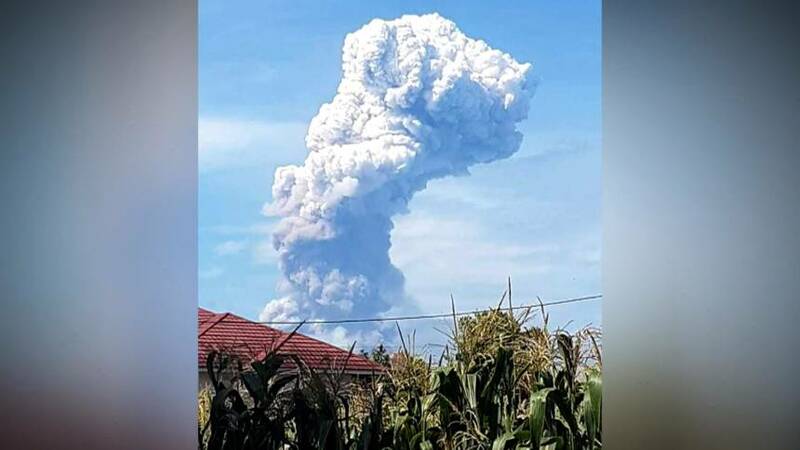 Australia stands ready to assist in assessing the damage and meeting the needs of affected communities,” Australian High Commissioner Bruce Davis said on Twitter. Emergency authorities in the Oaxaca reported “only material damage and no loss of human life” during the earthquake. 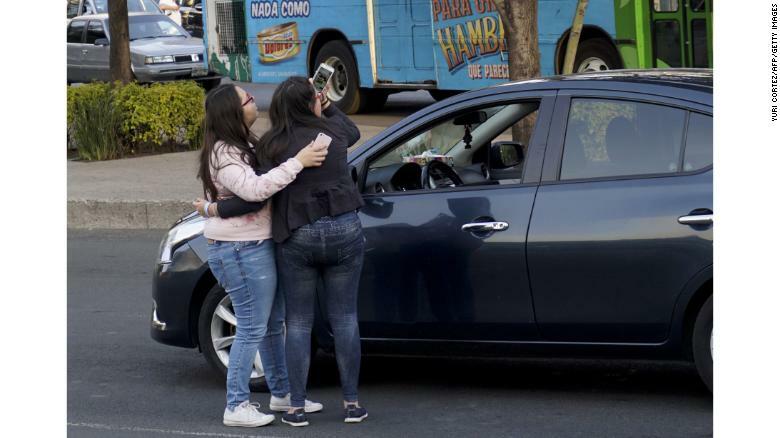 In Mexico City, where more than 200 people died in a large earthquake last fall, people streamed out of shaking buildings and into the streets. Video showed ceiling lamps swaying and people embracing after evacuating buildings. There were no immediate reports of injuries in Mexico City, which is about 348 kilometers (216 miles) away from the epicenter of the earthquake. 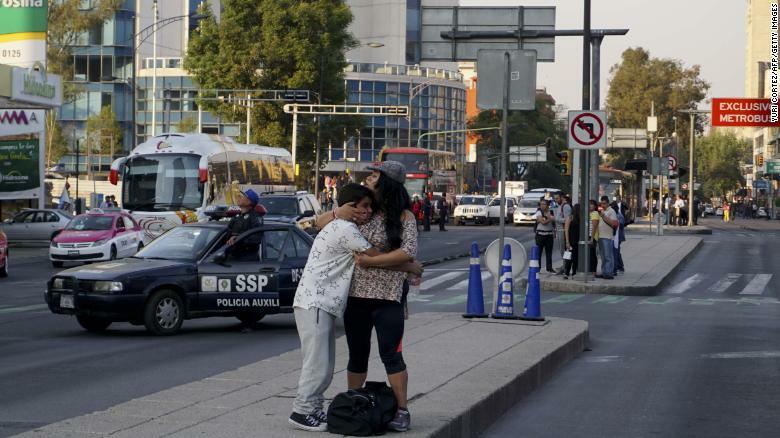 A woman embraces a boy after an earthquake shook buildings in Mexico City. People fled into the streets after the earthquake caused buildings to shake in Mexico City. CNN’s Leyla Santiago contributed to this report.